Home » Things that inspire me in the garden » Blogosphere ~ Celebration Time for Our Fairfield Home and Garden! 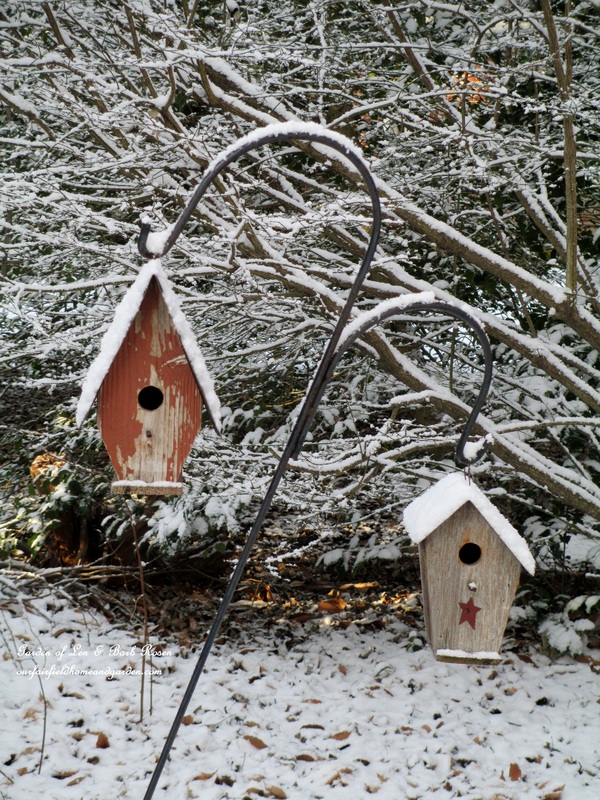 Blogosphere ~ Celebration Time for Our Fairfield Home and Garden! Last Thursday was a banner day for Our Fairfield Home and Garden headed up by this wonderful article by The News Journal gardening columnist, Moira Sheridan, and topped off with reaching 22,000 site visits and 5,000 Pinterest followers all on the same day! The timing couldn’t have been more perfect, just a couple of days past our web site/blog’s six-month anniversary! So, this week, I’d like to share Moira’s wonderful article and encourage you to follow your passion too, whatever it might be. Thanks so much everyone for making my little project such a success ! Written by Moira Sheridan. Moira Sheridan is a Wilmington freelance writer and gardener. She is a graduate of the University of Delaware’s Master Gardener program. Reach her at masher9@ juno.com. Read the full article here. A year ago Barb Rosen didn’t know what a blog was. An elementary school teacher with a penchant for gardening and home decoration, she was active on Pinterest, a popular Internet site for sharing pictures, but hadn’t considered anything more complicated. A conversation about her upcoming retirement prompted her daughter to suggest she start a blog as a way to share her garden projects and decorating ideas with others. She took the advice. With help from her daughter, Rosen launched a website featuring a blog, while continuing to manage accounts on Pinterest and Hometalk, a do-it-yourself home and garden project site. All three endeavors feature her photography, projects and crafts, and lots of inspiration. The website, ourfairfield homeandgarden.com, has had 21,000 site visits since going live in July and she has 5,000 followers on Pinterest. “The learning curve was really steep for me,” she said. Luckily, her daughter, Meg Henning, a librarian in Oregon with a master’s in information technology, walked her through the process via laptop. “I didn’t overwhelm her and as soon as she learned how to post a blog and insert a picture, she naturally wanted to insert five pictures. She gained confidence along the way,” Henning said. Rosen concurs that she took to the project from the beginning. “Meg showed me how to set up the pages, but I took all the pictures and chose the projects and which gardens to feature,” she said. For both of them, it has been a fruitful collaboration. “My mom and I have had a lot of fun with this,” Henning said. Much of Rosen’s success is due to her diligence in responding to comments and favoring pictures over text. “No one wants to read a novel, so when she does write about a project she includes step-by-step pictures. If someone comments on her post, she always responds,” said Henning, who is impressed with the traffic her mother’s website has generated. Rosen, who is still working full-time, usually maintains her sites on weekends. “I’m a full-time teacher so on Saturday I’ll take pictures and on Sunday I’ll sit down and do the postings. In summer I try to have two postings a week. You’re constantly looking at things with the eye of a possible project, planting, or vignette for the site,” she said. 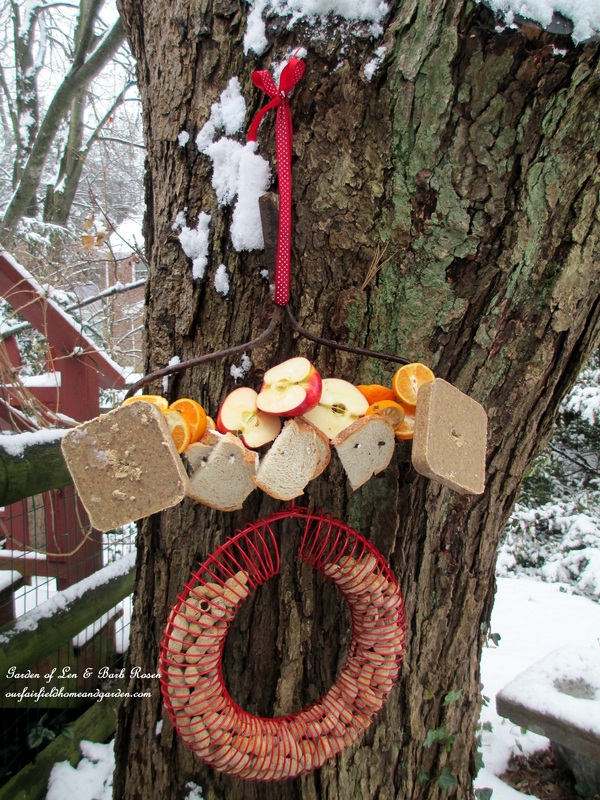 Recent pictures of her garden in the snow generated a flurry of interest, as did instructions for how to make a bird feeder buffet out of a rake and different looks for seasonal window boxes. She keeps three bird feeders up year-round, but after a recent snow, wanted to install a bird buffet feeding station. She found a rake in the shed and hung it from a tree with ribbon. 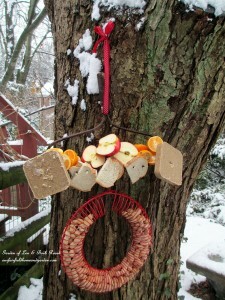 On the rake tines, she skewered apples, bread, suet cakes and halved tangerines. Then she hung a peanut feeder on the bottom, and placed it where she could see it from a window. Henning attributes much of her mother’s following to the time she spent developing an online community of like-minded people on Pinterest. “I told her there are lots of people who might be interested in reading about you and your projects, so when she started her blog she already had an audience,” she said. Rosen has discovered the website is also an efficient way to document her garden, showing bloom times, plant combinations, ornaments and maintenance needs. She has also enjoyed not only sharing her garden, but getting to seeing other’s gardens. “I now have a guest board on Pinterest for people to show their ‘real gardens’ and it’s like going on a mini garden tour,” she said. For anyone considering jumping into the blogosphere, Rosen and her daughter say go for it. “The sites that support blogs (WordPress and Google, for example) are all free and it doesn’t need to be perfect from the beginning; it’s a work in progress and it will evolve from that first page you create – just like a garden,” Henning said. Join the blogosphere! Set up an account through Google or WordPress, or take the plunge and make a website. This is a great way to connect with a community of gardeners. Check out Barb Rosen’s site, and also local gardener George Davis’ blog at fromseedtoscrumptious.blogspot.com. Both sites have lots of good ideas, with Barb focusing on ornamental gardening and George on vegetables. Order seeds from catalogs now, especially new varieties that tend to sell out quickly. Walk your property and check trees for storm damage. Schedule tree maintenance in winter to take advantage of special deals. Schedule mower maintenance now to avoid the spring rush. Great article Barb! You have so many great ideas. I work 32 hours a week and blog in my SPARE time too. Glad you enjoyed the article, we were delighted with it! Since you work and blog too, you also know how tricky it is to find enough hours in a day! Thanks for taking the time to stop by, read the post and write to me, Carlene!